This is a REST engine API that I use for some of my projects. It is very simple to use and has no dependencies. One of the nicest feature is that it documents the REST interface that you build with the engine. Note that this is only a REST engine and does not include a web server. You still need to listen on a socket for incomming requests and feed them to the engine and respond with the engine's output. Note how each resource uri and parameters are documented at creation time. To invoke a query, you only need to get the URI (after parsing it from a from a HTTP request or whatever other way) and feed it to the engine. Of course, your API might want to return some data, so this is done by passing an empty JSON document object (JSON interface is part of the project as well. I told you, there are no external dependencies in this project :) ) and the callbacks will populate it with the response. I recently was given a cisco 1760 with a 4 port FXS card and 2 DSPs. I decided to replace my PAP2T FXS gateway with that one instead. The cisco gateway is easy to configure. You need dial-peers which are basically dialplans. You need to configure voice ports and the SIP user agent. dial-peer voice 704 pots destination-pattern 704 port 2/0 ! You could also make several dial peers to be routed to the same voice-ports if you would like the port to have multiple extensions. By the way, when typing "dial-peer voice 734 pots", the 734 really is just a tag. It doesn't mean anything at a dialplan point of view. dial-peer voice 1 voip destination-pattern .T session protocol sipv2 session target sip-server session transport udp codec g711ulaw no vad ! I decided to get a Raspberry PI and make an expansion board to do all this. I made a server application for the rPI and now I can add many features to my house. I wanted my device to do two things only: generate events, and execute commands. So with a script, I can instruct it to execute a command based on any combination of events. Pretty simple, yet very powerful. For this project I decided to use ArchLinux on the rPI. I used the image ARCHlinuxARM-13-06-2012. I proceeded with copying the image on the flash disk, change the root password, allowed root login through SSH and assigned a static IP to the device. After that, I had a rPI device that I could access throuh SSH. Then I copied src/.libs/libasound.a and include/*.h in my source folder because I wanted to link statically with alsa so that I don't need to install alsa-lib on the rPI. My application could not find the device "hw:0,0", which should be the analog output on the rPI. I had to deploy a alsa.conf file that defines a device called "homeautomationsounddevice" and use that device when initializing the sound card. I used snd_pcm_open_lconf to specify the local configuration file that I created. To be able to use the serial port on the rPi, I had to disable the serial console. There is tons of information about this everywhere so I won't go into the details of that. Since the rPI uses flash memory, I didn't want to wear it out by writing tons of logs on the flash card. So all my debugging output is done through syslog. On the syslog server, I had to edit the bootscripts to start syslog with the "-r" option to listen for incoming syslog messages. Then I had to edit /etc/syslog.conf to log all local7.info logs in a separate file: "local7.info /var/log/syslog-local7"
I had to install a DNS server for my alarm system's IP module to work (more details below). So I installed bind and made it start automatically on boot. I then created a zone for (dhas.ca) with an MX record. The IP module is the only one to use the DNS server so I don't care for domain name collision. When I need a toolchain for cross-compiling, I usually install everything manually. But this time, for the rPI, I saw that everyone was using "crosstool-ng" which is a script that will build a toolchain for the target platform of your choice. I decided to give it a try. At first it was failing to download the gcc package so I had to look at the logs, find the package in question and then download it manually. I stored it in the tarball folder that it was supposed to be copied in and then everything else went fine. Note that is is very important to specify "softfp" as the FPU. Otherwise, some libraries like Lua will fail. After the toolchain was built, I proceeded with writing a test application and copied it over on the rPI. The application would not execute, I always got an error "No such file or directoy" even though the file really existed. After much searching I tried doing "readelf -a test2 | grep "Requesting"" and I got "[Requesting program interpreter: /lib/ld-linux-armhf.so.3]". that file did not exist on the archLinux that I installed on the rPI. I had to make a symbolic link of that name to /lib/ld-linux.so.3 and then everything was fine. I guess the real fix would be to fix my toolchain, but I'll leave it like that for the moment. 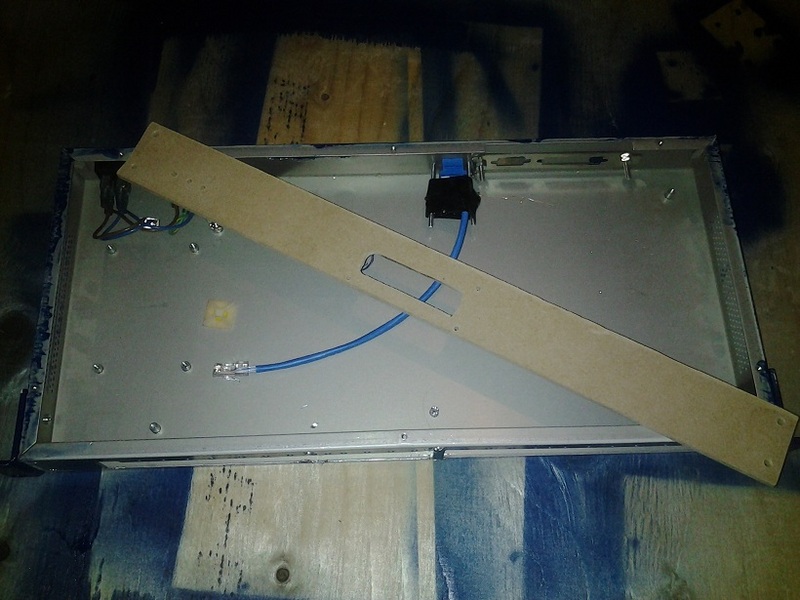 I wanted to rackmount my device so I started to look for anything that is rackmountable on kijiji. 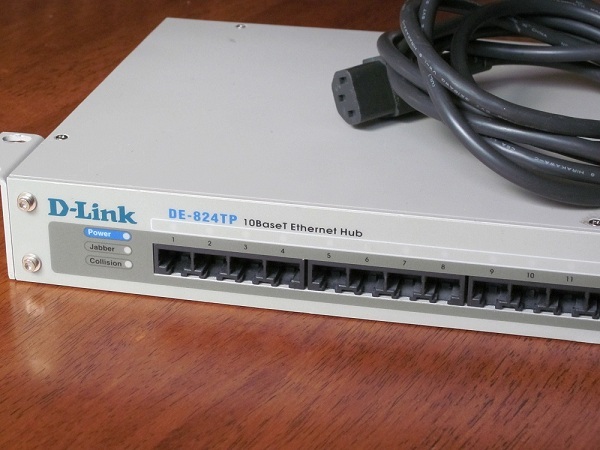 I was looking for a broken device but then I found this guy who was selling a working hub for 5$. The hub had a power supply that provides 5V and 12V. Perfect for my project. So I removed everything inside except the power supply. For the front panel, I used a piece of 1/4" MDF and I spray-painted it. 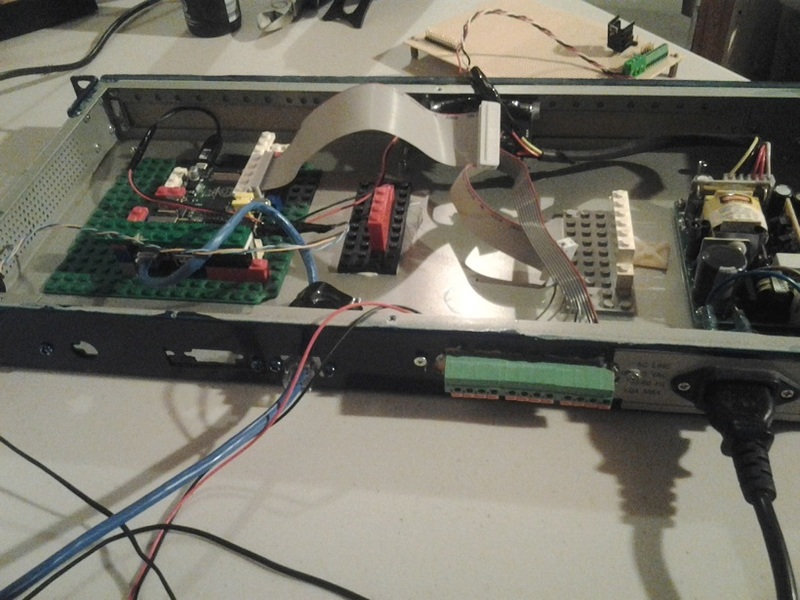 In order to get the PCBs to hold in place in the case, I used a sheet of lego that I glued on the bottom. Then I made the PCB hold in place with legos. I had a hard time cutting the holes needed for the terminal board, the LCD and the RJ45 connector. I used a drill and made several holes until I get this big ugly rectangle-like hole. For the LCD, it wasn't easy aligning everything. Next time I will use a CAD and prototype on cardboard first (thanks to ESawDust for the idea). 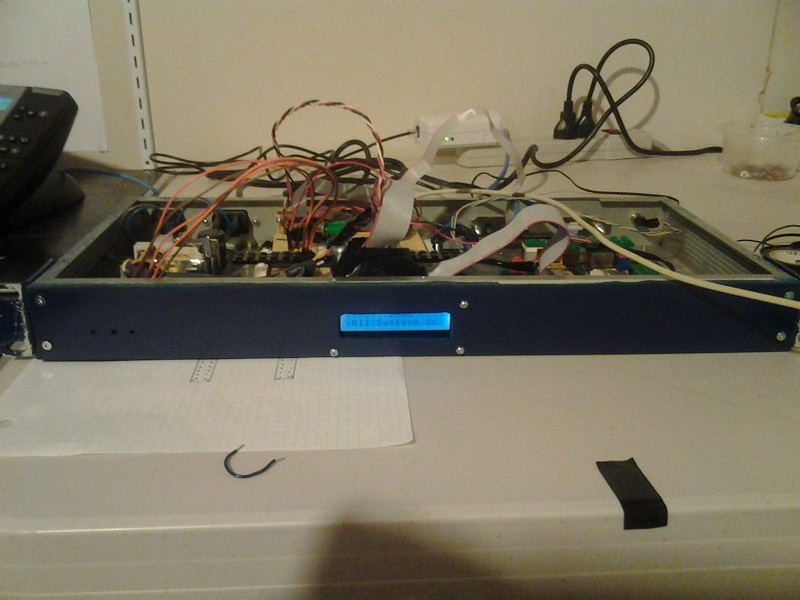 Add a ATMega1284P to drive some LED and a LCD display on the front panel. I had to use the bcm2835 library that was written for interfacing the GPIO in C. For this reason, I had to licence my code under GPL. When I get some time, I will write my own and use it instead.I hate GPL. I'd rather just give my code out for free with no strings attached. That's what I usually do. But at least that library is well written and very easy to build and use. The SIP portion of my software uses resiprocate. I had to cross-compile resiprocate for the ARM platform. There was a couple of hiccups but it compiled fine. I had to do a couple of tweaks in the source code and in the makefiles to make it build but nothing too big. Basically what was missing is some references to the include file "cstddef". I included the file in all failing sources. I also had to modify the Makefile so it would link against librt too. I've seen bigger problems on other software builds. I am linking statically to resiprocate so I didn't need to copy anything on the rPI. I was able to compile LUA for the rPI with "make linux CC=arm-unknown-linux-gnueabi-gcc" Actualy that command failed. But it doesn't matter because it failed after it was able to create the static library file. So I copied all the header files and the static library in my source folder and I used it that way. VOIP Service. Used to place calls when a module has an event to report or to receive calls to control one of the other modules. PGM Service. Used to monitor triggers such as PGM on an alarm system, sumpump events or a door sensor event. Insteon Service. Used to report events received by an insteon modem or to send a command to the modem. REST Interface. Used for invoking commands on different modules. SMTP server. Used to get emails for events generated by Paradox IP100 module. Event Processor. Used to receive JSON formatted events from different modules. I am planning on adding another module eventually to interface my to IR cameras. retrieve full list of logged PGM events. if pgm number is given, only logs for that PGM will be returned. Will subscribe for presence events for the given extension. The extension must be a known extension in the subscribe context of our UA (if using Asterisk). Will call the given extension and optionally play sound when the remote peer answers the call. Placing a call only works if the user agent was previously registered. Called extension must be know by the proxy because direct URI are not supported. To make an intercom call (where the UAS will autoanswer) this needs to be configured on the proxy. Play sounds on an active call using given callID. When a module needs to trigger and event, it sends a JSON formatted message to the EventProcessor. The event processor then executes a function in a Lua script. The Lua script has a handler that will receive the JSON message. It is up to the user to write his own Lua script to trigger any desired actions upon receiving an event. The script can trigger actions by initiating a RESTful request to the application. The script needs to have one function defined: onEvent(str) which will be called by the EventProcessor. The phone service will not allow any calls to be placed unless the user agent is sucessfully registered. This is done with the REST command /phone/register?user=πn=&proxy=. The phone service will accept calls for any users (extension) at its address. It will answer all calls and will trigger an event containing the called extension and all DTMF tones being sent its way. The protocol is a bit difficult to use. I'm not sure why they made so complicated. For example, when sending a "status request" command, we get a response back but we don't get the command number back in the response. So it is hard to know what that response is for. So we have to remember that we were waiting for a response like that. It's diffucult to make a nice asynchronous parser. I can think of a thousand ways to make that protocol easier to use. When sending an insteon command, you need to wait to get the echo back with a NAK or ACK. If you get an ACK and you are expecting to get a response from a device after issuing that command, you need to wait for the response. Things cannot be done in a trully async manner. If you send a whole bunch of commands and expect to get a whole bunch of responses after, it won't work. So before issuing a command, you need to make sure you got the expected response of a previous command (or use a timeout). At least it works that way for "Status request". If you send 10 "status request" in a row without waiting for the reponse of each, then you won't get all responses. At least that's my experience, I don't remember seeing that in the documentation. The only problem with the way I'm doing things is if I get an unsolicited event (someone opened a light manually) between the echo of my command and the response I was expecting. I am assuming that the PLM will handle such a case for me and send me the events in the right order. Otherwise, the protocol has a major flaw in my opinion. The first lines in the global scope will be executed when the server starts or whenever the script is reloaded. This is a good place to do initialization. In my example, it is where I initialize my insteon devices. These lines are necessary since the server needs to know about the insteon devices. Then there is the onEvent handler. This function will be called whenever an event occurs on a system module. This is where the power of Lua comes into play because I can apply any logic I want using the Lua script. The script will always stay loaded so if a event occurs and the script sets a global variable, this variable will still hold the same value upon receiving the next event. This is true only until the script is reloaded though. Since all global variable values are lost after a script is reloaded, 2 functions are provided to the Lua scripts: getVar(key) and setVar(key,value). These two functions provide peristant storage of values even when the server is restarted. My alarm system allows me, with the use of a jumper on the board, to specify if I want the PGM to source 12V or sink to ground. I configured it to sink to ground. That way, the PGM will act like a switch. When PGM is activated, it will be connected to ground, when deactivated it will be disconnected. So with a pull-up resistor to the 3.3V pin of the rPI, the GPIO on the rPI will get 0 or 3.3 V depending on the status of the PGM. I configured one of my PGM to activate/deactivate following the arm status of a partition. The second PGM is configured to activate when any of the zones are in alarm and deactive when any of the zone alarms are restored. I currently have 4 light switches. 1 in my bedroom, that turns on in the morning when I get my wakeup call. I have another one for the outside light at the front door. This one gets turned on based on a schedule (sunset until midnight). Another one in the living room gets turned on when the alarm system gets deactivated between sunset and sunrise. The other one is in my basement and has no special purpose. I use my EZFlora to water my two vegetable gardens at 5 in the morning. I can cancel a scheduled watering or schedule another one. I configured my alarm system to activate/deactivate a PGM (a relay on the alarm system) when we arm/disarm the system. The rPI monitors the PGM using a GPIO pin. The rPI logs all activity about the PGM in a local file. This is done by a homemade server application. The server application also listens for RESTfull queries on a TCP port. Now any computer in my house (including my tablet and smartphone) can make a request to the rPI using a webbrowser and it wil get a JSON formatted response indicating the status of the alarm system or a list of arm/disarm events with a timestamp. This is usefull to know if someone is at home while I am away or to know if the system is currently in alarm. Install bind on the rPi and create a zone with an MX record. Make a fake SMTP server that receives the emails and parses them. 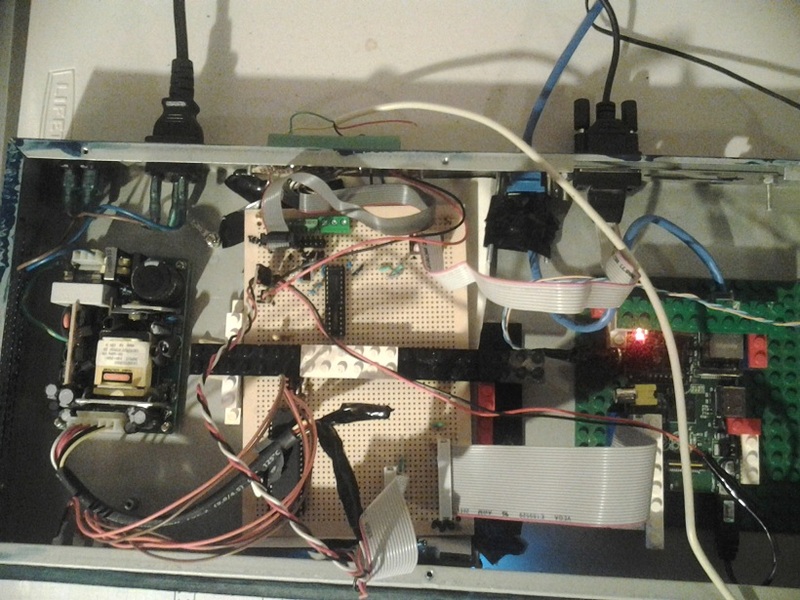 The SMTP server is a module in my homeautomation system instead of a stand alone SMTP server. It is just a module that listens on port 25. The DNS server (bind) has a zone that resolves an MX record to the address of my home automation system. The alarm system IP module has been configured to use that DNS server. When the SMTP server module receives an email, it parses it and trigger to appropriate event It is a complicated setup and it is a shame that I need to use it that way. But now, at least, I have a way to know who armed/disarmed the alarm system and when it occured. I am currently using the alarm system PGM to know if the system is armed or disarmed. This is very reliable because if an event occurs while my software is down, I can always check the PGM status on load. But I also use the SMTP server to get notifications of who armed and disarmed the system to trigger a welcome call on the phone close to the front door. The welcome call greets me and tells me how many voicemails I got while I left. The voicemail announcement depends on who disarms the alarm, because we each have our own voicemail box. Since I run an Asterisk server at home, all my phones are IP phones. With this in mind, I decided to leverage that in order to call my device and send it DTMF tones to control different actions. So with a phone in the house, I can turn on/off lights and trigger any other actions that my device is capable of. I also have an Aastra phone that has some buttons I can assign XML web pages on. When pressing a button, it fetches an XML document at a URL of my choice and displays the content on the phone. I don't really care about the XML. With these buttons, I execute some REST commands on my device to turn on/off my bedroom lights and setup a wakeup call. I recently bought an Insteon irrigation controller called the EZFlora. In this article, I will describe how the controller works and how to use it from scratch with a PLM. I am not using any well-known software to control my Insteon devices. This information is usefull for people building their own software and communicate directly with the PLM . Before going any further, basic knowledge of how to send standard and extended commands to a PLM is required. This is part of my Home Automation system. You can find an example source code in that Home Automation system article. The EZFlora is a 8 zone irrigation controller. It allows me to control up to 8 solenoid valves for my garden. The EZFlora lets you open/close a valve or run a program. A program is a sequence of timers. It is possible to make 4 different sequences. A sequence is represented internally by an array of 8 bytes that represents the runtime in minutes of each valve. Byte 0 is for valve 0, byte 1 is for valve 1 etc. Programs are very usefull because your application sends a command to start a program (sequence) and just waits for the results. If your application would open a valve and for some reason the application crashed, hung or communication with EZFlora would go down (or any other reasons), then you could not send a "valve off" message. With a program, you leave it to the EZFlora to do everything. An application "uploads" such programs by sending the "set sprinkler timers" extended command. CMD1 is 0x40, CMD2 is the program number (0-4) and the first 8 extended bytes represent the sequence. Note that this will store the program into eeprom. The program numbers are from 1 to 4. Program number 0 is the default timers. Default timers are used when a valve is opened with the "valve open" command. After the timeout expires, the valve will close. This is usefull in case you would forget to close the valve. My server initially sends a "sprinkler control" command to enable valve status messages. These messages are broadcast messages. The annoying thing is that the PLM will not forward those events to your application. So my server needed to put the PLM in "monitor mode" using command 0x6B (see the 2412 Dev guide). It is really important that you do this, otherwise you will not receive any of the broadcast events. The EZFlora also needs to be in the PLM's All-Link database. One nice thing is that any "sprinkler control" command sent, will return a status byte in the ACK message. So by sending such a command, I am also requesting the system status indirectly. Now every time a valve status changes, I will also receive a message that contains the status byte. The status byte tells me what valve is currently opened and what program is running (if any). As the command set document indicates, the status event broadcast message also contains the water meter counter hidden in the "To Address". So bascially, when I send a command to start a program, I get the valve/program status in the ACK message. Then everytime the program activates another valve, I get a broadcasted message with the valve/program status and the meter counter value. And the end of the program, I can see in the event that the program is not running anymore and using the meter counter I know how much water was used during the whole program. Note that when a program turns off a valve and opens the next one, it broadcasts only one event with the newly opened valve number. This is fine since the EZFlora always activates one zone at a time. So when you see that valve X is opened, it is safe to assume that all other valves are closed. Water meter counter It is possible to attach a water meter counter to the EZFlora and get events every time the meter makes a pulse. The meter I was looking at generates 450 pulses per liters. That would generate way too much traffic. So I decided to leave the "Meter count change" event off. Instead, I reset the counter everytime I send a start valve or start program command. And I look at the meter count every time I get a status message. When I get a status message that says that no program is running, I can deduce that it was because a program has terminated so I check the meter count and I know how much water I used while the program was running.